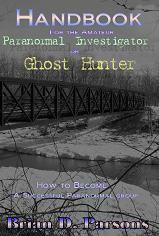 "Handbook for the Amateur Paranormal Investigator or Ghost Hunter: How to Become a Successful Paranormal Group." A new book release from Brian D. Parsons, the Director of O.P.I.N. The Ohio Paranormal Investigation Network (O.P.I.N.) is a database of personal investigations in conjunction with various reports and documentations on ghosts or other paranormal activity. This website is for informational service only and is based strictly on opinion. If you need assistance with a ghost or other paranormal situation please let us know, we will be happy to set you up for an interview or on-site investigation. Feel free to use the the Contact link or use the Ghost Help link below for some online advice and to contact us. We are not mere ghost hunters, we are client-centered paranormal investigators. We are here to help you through your situation and not so much concerned about finding "proof" of ghosts, though we hope to gather some data along the way! We are a small team of paranormal enthusiasts who investigate the paranormal by applying logic, science as well as interviewing to collect case study information. We believe that the study of ghosts should start with those who are in need of help and not to merely sit in a dark house and expect a ghost to show up. In other words; we feel studying ghosts starts with the living and not the ghosts themselves. We work with the client to investigate what is happening with them and the environment and not focus on the ghost in its entirety. Our focus is not with fancy gadgetry, but working with the client to ease what is happening while hopefully collecting information and data along the way. Here is our official "Who are we?" page. © Copyright 1996-2007, Ohio Paranormal Investigation Network.